Our beautiful pond located in the heart of the village is popular with villagers and tourists alike. It is maintained by a group of volunteers a couple of times a year when we trim the area around the pond to manage the plants and keep things looking good for the village. admire our pretty pond as you walk or drive through the centre of the village? your children like to stand by the pond looking at the ducks and geese? you have an interest in pond habitat? If you are interested in being involved with the pond, please send me your email and I will keep you updated. Contact either Hilary Boardman (751230) hilary.boardman@gmail.com or Peter Cook. Below is the history of how the pond has developed over the years and the major overhaul that took place in 2005 with support of the Parish Council. 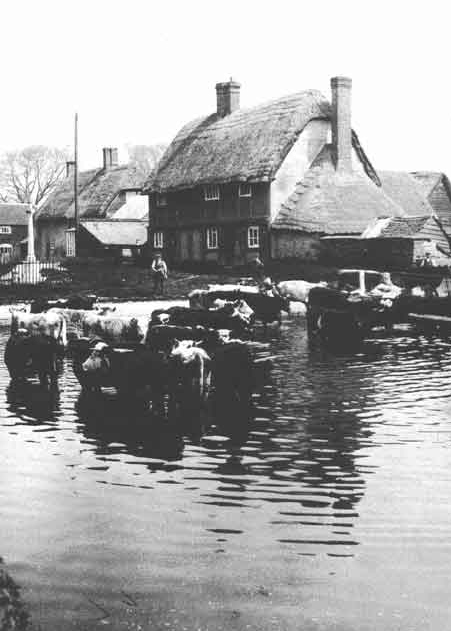 Around the Downland villages, Childrey is often referred to as ‘the village with the pond’. There seems to be no record of when the pond was first created or why but it has certainly been there for centuries. Living memory and photographs confirm that it was used for watering livestock; the shallow ends suggest that it was an ‘in and out pond’: horse drawn vehicles could drive through it to water horses and wet their wheels. It may well have been used by the wheelwright at Charles Cottage. Photographs show that it was used for watering cattle. In those days there is every probability that water from the spring line up in the Holloway would have run down the road to fill the pond. During the last Century this water has been diverted into drains and the pond fills from a much smaller area, mostly the road. Serene as the pond may look, it’s history records ‘troubled water’ in village politics. 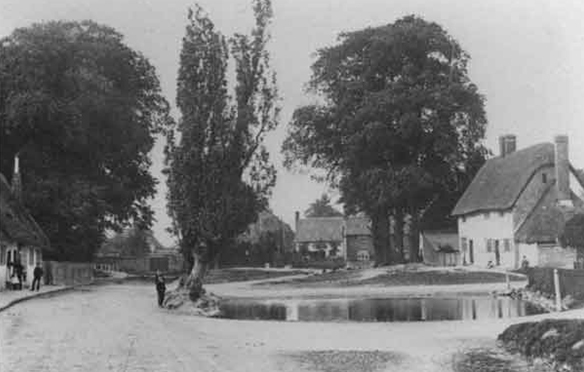 The pond, it seems, frequently dried up and in 1911 a councillor living at Pond Farm suggested filling it in and replacing it with a trough and pump. The pond was threatened again in 1938 when it was reported to be polluted and unhealthy. Thankfully the pond has survived both incidents. The Pond file in the Parish Council archive makes interesting reading. A plan to de-silt the pond is recorded in 1968 and an application for financial assistance made in 1969. A grant was eventually given in 1970 by Berkshire Highways. In 1982 there was a controversy over a volunteer pond-cleaning initiative. Inaccurate reporting in the local press created big stir and a flurry of letters. The welfare of ducks and ducklings and a disagreement over siting a duck house was at the heart of the issue. A village meeting on that occasion seems to have replaced rumour with truth and village unity was restored. In 1993 the pond dried up again. It was a drought year, but a leak was suspected to be a more likely cause. Childrey Parish Council started correspondence with Vale of White Horse, National Rivers Authority Conservation Officer, Pond Action at Oxford Brookes and BBONT. A volunteer group was formed and grants were sought. 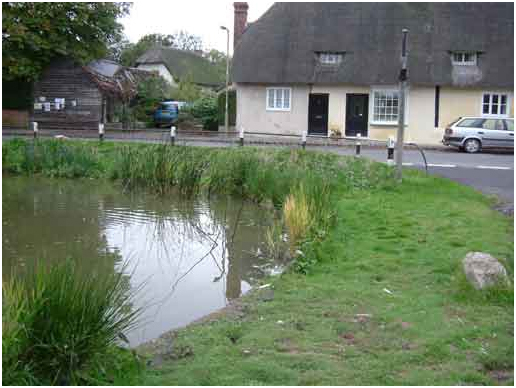 In February 1994 the pond was pumped out and a survey report later published by Pond Action. Rural Action and the District Council provided some funding. During June and July the volunteer group carried out the recommended treatment, pumping silt out, repairing the concrete walls and planting some of the margins. Their success was sadly short-lived. Oxford Brookes in the guise of Oxford Polytechnic conducted a survey of ponds in Oxfordshire parishes in February 1988 which oddly did not include Childrey village pond. Now ‘Pond Conservation’ they have been a key player in the restoration. From 1995 sewage spills resulted in CCTV investigation and showed willow tree roots in the sewer. In 1999 one willow tree which stood close to where the Millennium sign now stands was felled. From 1999 to 2000, water levels had been closely monitored and correlated to rainfall. This data indicated that the rate of water loss was not wholly due to evaporation but consistent with a leak. It was also obvious that the level of pollution had suppressed all water and plant life. The Parish Council which had a modest ‘pond fund’ now started investigating pond renovation in earnest and contacting several experts. Thames Water was pursued concerning numerous sewage spills. When three quotations for the work of renovation were obtained it became clear that the cost would be beyond the Parish Council’s budget and efforts to get grant funding were redoubled. 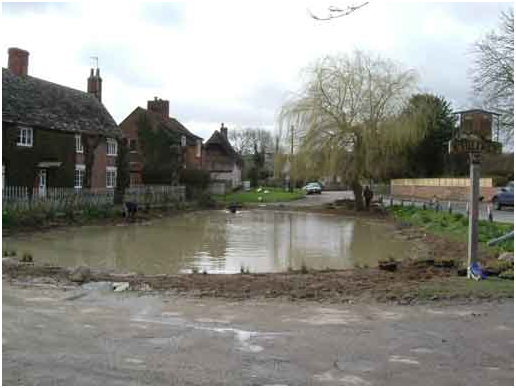 The Environment Agency was the first donor, with a village improvement grant of £500. Thames Water was persuaded to give £500 to recognise the sewage spillages. But much more money was needed; the Trust for Oxfordshire’s Environment (TOE) and Heritage Lottery were both considered but the Parish Council chose to apply to TOE as the pond project fulfilled many of the criteria required by them for funding. As the community had already paid Landfill Tax through its Council Tax there was some appeal in the idea of getting some of it back. A visionary group of village ladies organised a huge fund raising event called ‘Childrey Splash’. A dinner and auctions were held in a grain barn specially transformed for an evening. The combination of their efforts, the use of the barn and the generosity of those providing or bidding for items or services, added over £3.000 to the kitty. A pond restoration committee was set up in response to guidelines for grant funding, and their ideas presented to the Parish Council for decision making. The Childrey application to TOE was considered in May 2005 and not rejected; but to justify the expense they wanted an independent assessment of the pond. Rod d’Ayala from Pond Conservation visited the pond and recommended the project which resulted in a grant of £15,000 being awarded in September 2005. The project finally got the green light. 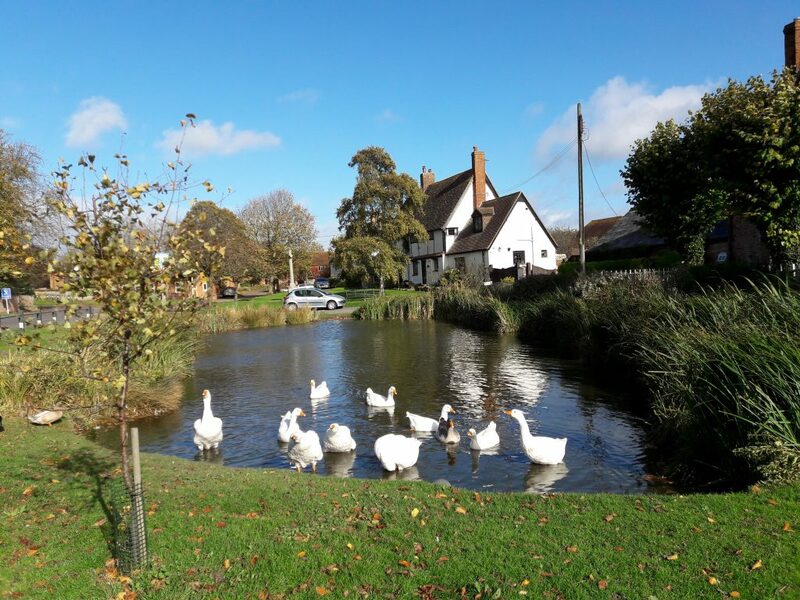 The Parish Council decided that the pond contractor to be engaged would be under the guidance of a consultant from Wetlands and Wildfowl Trust. One of the reasons was to ensure that the resident ducks and geese would be cared for and who better to understand the problem than a man from Slimbridge, the bird sanctuary renowned for its founder, Sir Peter Scott. A suspicion that water was escaping between the concrete sides of the pond and the old clay lining could not be proved, but all experts consulted recommended laying a membrane over the join. The first job of the contractor was to pump the water out. Analysis of the pond sediment showed that it was contaminated with hydrocarbons, and this had to be dug out and removed to a licensed land fill site. A layer of clay half a meter deep was then dug out and a liner was laid covering the join between the concrete and clay. This liner came in very heavy rolls, like carpet, a sandwich of sodium bentonite, (artificial clay which swells on contact with water) between two sheets of textile. This combination makes it moderately puncture proof. It was laid in overlapping strips and immediately covered using the original clay, creating a completely waterproof basin. This basin was then landscaped using coir rolls backfilled with soil to take plants. 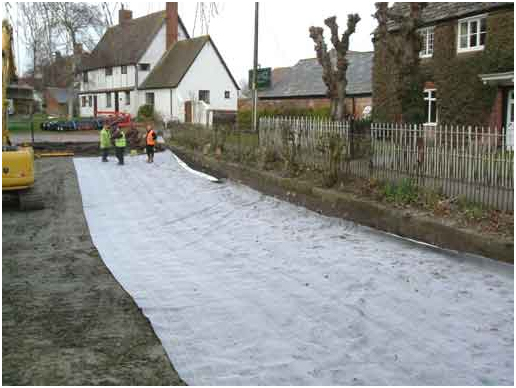 Existing drains were extended into the water and more coir rolls placed to slow inflowing water, so that sediment will drop where reed beds will establish to absorb some of the pollutants which are suspended in the water running off road. Once the landscaping had been done it was time to prepare for planting. Thames Water kindly filled the pond from a fire hydrant. Ideally rain water would have been better, but it was important to have water in the pond for planting to begin. Over 1000 plants were put in both in the water and at the edges. Temporary wire netting was placed round plants to protect them from being uprooted by the returning ducks and geese. Additional help and information has come from Pond Conservation which has been pioneering pond ecology studies. It might surprise you to learn that unlike almost any other habitat, ponds are unprotected and have seriously declined in number over the years. New studies reveal the huge diversity of wildlife species found in ponds and as a result the number of ponds being created or restored is thankfully growing again along with the understanding of their ecology. The process of maintaining and improving biodiversity is at the heart of the grant funding initiative, which together with supporting community schemes is aimed at improving the environment. 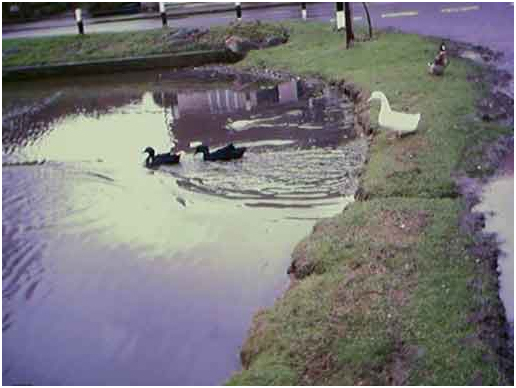 In 2005 the pond was a smelly, muddy puddle with green weed and slime, which even the ducks shunned. It is now an attractive pond surrounded by healthy vegetation instead of concrete walls, and survived the drought conditions of 2006 without any hint of drying up. The scheme has worked! The ducks responded to their improved environment, frequently diving which they could not do before. 10 chicks hatched in the first summer, of which four grew to maturity. An art competition was held at the village school for pictures of ducks and 6 winners have their art included on a sign which was later erected by the pond. Unbelievably, a rumour emerged the very day after the art competition that the council planned to remove the ducks from the pond. It was just a rumour. What did require removal was a huge number of goldfish. A substantial number of adult fish were illegally released in the pond soon after renovation and in the perfect conditions bred prolifically producing thousands of small fish. A non-native species which requires careful water treatment in domestic ponds, goldfish are totally unsuitable for a natural pond, and by polluting the water and eating natural wildlife, threaten the health and balance of what is a fragile environment. Unfortunately a few fish escaped capture and numbers will have to be monitored. 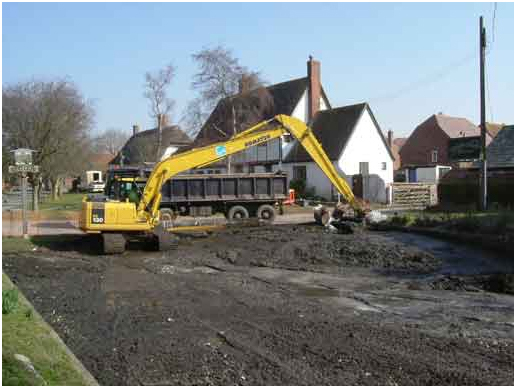 Endeavouring to eliminate sewage spills, Thames Water have used root cutting equipment and put the sewer on an annual inspection and maintenance schedule. This should prevent the recurrent blockages. There was some concern among villagers because of relatively new advice on duck welfare. Everybody knows that it is fun to feed bread to ducks. Only recently has this become frowned upon because observation and research has revealed that far from being kind to ducks, feeding bread is positively harmful to them. Railings by Pond Farm, which date from about 1905, have been restored and repainted in a similar green to their original colour. This was possible due to the money raised at Childrey Splash. One year after the renovation the pond margins looked wonderful with plants thriving and flowering and the ducks nesting again.